Rallying from two first-quarter interceptions, New Orleans Saints quarterback Drew Brees did just enough to outshine Brett Hundley and the Green Bay Packers at Lambeau Field, 26-17. Brees finished the contest with 331 passing yards and one touchdown against his two picks, while running back Mark Ingram bullied the Packers’ defense for 105 yards and one touchdown on 22 carries. Saints receivers Michael Thomas and Ted Ginn Jr. combined for 223 yards on 14 receptions as Brees’ top two targets. The duo often helped the Saints’ offense extend drives on critical downs, allowing Brees & Co. to put points on the board. Standing in for the injured Aaron Rodgers, Hundley didn’t quite have a day to remember. He completed just 12-of-25 passes for 87 yards and one interception. While he did add 44 yards and touchdown on the ground, his efforts, nor rookie running back Aaron Jones’ rushing efforts were enough to sneak by New Orleans. Jones rushed for 131 yards and one touchdown on just 17 carries (7.7 yards per carry) to log his second career 100-yard game. The veteran Ingram got the bulk of the carries for the Saints, as he carried the ball 22 times for 105 yards, including 45 yards after contact. Even though Ingram broke just one tackle and averaged an ordinary 2.0 yards after contact, he impressed by finding open space and taking advantage of the Packers defense’s misalignments, as he was able to constantly get to the edge and gain easy yards there. While Ted Ginn Jr.’s hands have been criticized over the years, he had a perfect afternoon against the Packers, as he caught all seven of his targets for 141 yards, including 101 yards after the catch. 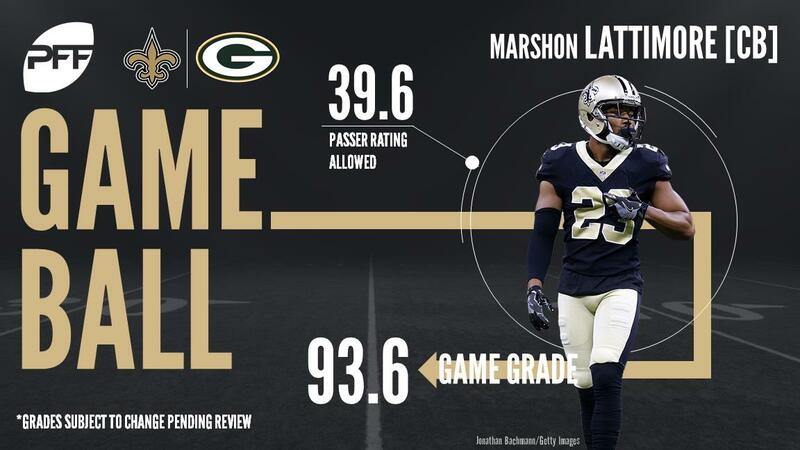 Ginn Jr. caught a pass in the coverage of five different Green Bay defenders and QB Drew Brees had a passer rating of 118.8 when targeting the former Panthers receiver, which was the highest among Saints receivers against the Packers. Rookie cornerbacks are supposed to struggle early in their careers. Nobody told that to Marshon Lattimore, who looks like a top-five cornerback through the first seven weeks of the season. Today Lattimore was targeted three times in coverage. He gave up zero receptions, with two pass breakups and the third incompletion came with him forcing the receiver to the sideline. He was targeted on another play, negated by penalty, and once again broke that pass up. Another rookie who flashed for the Saints today, Hendrickson rushed the passer just nine times, but came away with a hit and two hurries. On just 50 pass-rushing snaps so far this season, he has racked up a sack, three hits and four hurries, giving hope to Saints fans that they could have found a pass-rusher in the draft. Hundley wasn’t terrible by any stretch today, with just one really poor throw that resulted in the interception at the end of the game, but he didn’t do anything with his arm to put the Packers in position to win the game. From 28 dropbacks, he threw the ball away four times, and completed just one pass travelling 10 yards or further downfield, but he did have two key scrambles for 36 yards, including a touchdown. Jones has exploded onto the scene since getting his shot, and impressed once again today. Averaging 3.58 yards after contact per carry, he forced two missed tackles on the day. Jones has showcased the ability to move the chains and provide game-breaking plays, as evidenced with his long touchdown early in the game. The second-year Clark continues his very impressive season, as he was the Packers’ highest-graded player against New Orleans. The former UCLA defensive lineman found success rushing the passer, as he picked up a hit and two quarterback hurries on 28 pass-rushing snaps. However, he was even more impressive against the run, as he wreaked havoc and consistently won his battles against the Saints’ interior offensive linemen. Similarly to Clark, Daniels also had a lot of success against the New Orleans interior offensive line, as he recorded a total of two run stops and forced runners to change direction multiple times. Furthermore, just like Clark, Daniels also recorded three total pressures – one quarterback hit and two quarterback hurries.